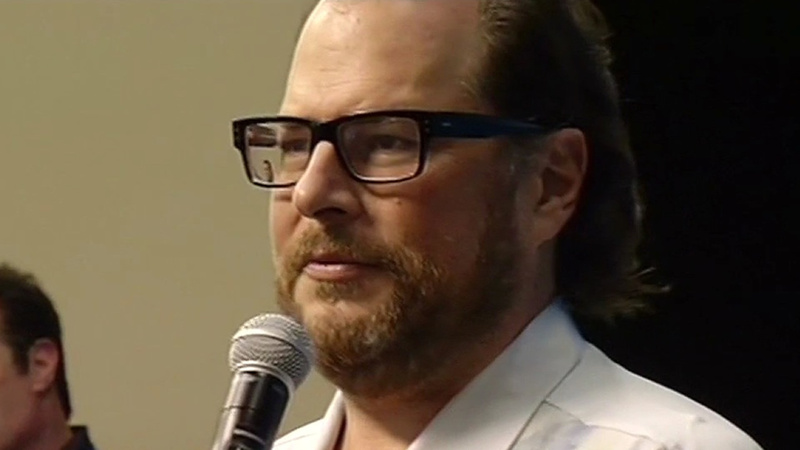 SAN FRANCISCO (KGO) -- Salesforce CEO Marc Benioff announced Tuesday he and the company will donate $3 million toward ending family homelessness in San Francisco. He made the announcement at the grand opening of Salesforce Tower. The philanthropic arm of the company will donate $1.5 million to the initiative, which will be matched by Benioff and his wife Lynne. The support structure for the Salesforce Tower is now complete. It's officially the tallest building in San Francisco. The money is being raised for the Heading Home Initiative, a joint effort conceived by late San Francisco Mayor Ed Lee and the City and County of San Francisco along with the San Francisco Unified School District, private philanthropy and Hamilton Families. "Homelessness is the most urgent issue we face in San Francisco and it is unacceptable for any child to sleep on the street," Benioff said in a statement. "As a city and community, we have a moral obligation to make sure that every person and family in our city has a home. Lynne and I are proud to support the tremendous work of Hamilton Families and the Heading Home Initiative to end family homelessness." The tallest building west of Chicago will topped off in downtown San Francisco. It's a major milestone for Salesforce Tower which has been under construction over the past four years.